The Family of Jesus is a simple nuclear family. We are told that Mary is his mother and that Joseph is his foster father. At first blush this seems straightforward. But not if you look at the story of Joseph of Nazareth from the perspective of the Talpiot tomb. In March 1980 construction workers uncovered part of a burial cave belonging to the Second Temple period in the south of the Old City of Jerusalem, in the vicinity of East Talpiot. Based on the names inscribed on the ossuaries (bone boxes) excavated from this tomb some scholars claim that this is the family tomb of Jesus. Other scholars vehemently oppose this claim. One of the principal reasons they cite as to why the Talpiot tomb cannot be the Family Tomb of Jesus is that the ossuary of Joseph the foster father is not among those excavated from this tomb. Could there be a reasonable explanation for this? The seemingly straightforward Joseph of Nazareth is actually ambiguous. The principle source of information about Joseph the patriarch of the family of Jesus is from the first chapter of the gospels of Matthew and Luke. They are also probably the only reliable source. However apocryphal literature abounds with information about Joseph. Yet the reason they have not found their way into the Canon of the Sacred Books could be because they are not considered to be reliable. Besides this, even though some of this literature is based on dependable traditions they are considered too fantastic for a place in the Sacred Books. The apocryphal literature concerning the life of Joseph include the “Gospel of James”, the “Pseudo-Matthew”, the “Gospel of the Nativity of the Virgin Mary”, the “Story of Joseph the Carpenter” (Fig 1), and the “Life of the Virgin and Death of Joseph” (1). To make matters worse not all of this little information is consistent. There are differences in the accounts of Matthew and Luke. Matthew was Jewish and wrote for a Jewish audience. Therefore if he is to present Jesus as the king of the Jews, his descent from David was paramount. This is why he begins verse one in 1:1-17 by describing Jesus as the “son of David, the son of Abraham.” In his statement Matthew gives more importance to Jesus’ kinship to David the king of Israel than to his descent from Abraham the father of Israel (4). If the bloodline of Jesus is to fulfill the condition that he is the son of David and the son of Abraham (5), then his lineage must only be traced through the legal father of Joseph i.e. Jacob. Doing this was important from Matthew’s perspective because he was trying to project Jesus as the heir to the throne of David – the new “King of the Jews”. In an attempt to emphasize this Matthew refers to Jesus as the “son of David” seven times in his gospel (6). And it is only in his gospel does Jesus refer to the “The throne of his glory” (19:28, 25:31). By tracing the lineage of Jesus through Joseph the adopted father, Matthew was following Jewish tradition since it was the practice then for an adopted son to be given the lineage of the adopted father (7). One explanation as to why Matthew refers to Joseph as the son of Jacob is that of Julius Africanus (Epistle to Aristides, c. 200-225). According to him a woman named Estha (the name according to tradition) was married to Matthan a descendant of Solomon (Mt 1). She bore a son named Jacob. After the death of Matthan, Estha married Matthat a descendant of Nathan (Lk 3). She bore him a son called Heli. This made Jacob and Heli half-brothers. When Heli died without any heirs, his half-brother Jacob took his widow as his levirate wife. Joseph was born of this union. Thus Joseph became the biological son of Jacob while being the legal son of Heli. Julius Africanus claims that his account is based on information given to him by the descendants of James the brother of Jesus (8). However this explanation does not pass Jewish tradition. According to Jewish tradition the genealogy of a levirate son would show him as the natural son of his deceased father and not as the son of his natural father. The author of the gospel of Matthew was either fully aware of Jewish tradition or tended to ignore it as otherwise he would have had to reproduce the genealogy of Joseph on similar lines as that of Luke. However this explanation will be true if Jacob was the legal father of Joseph and Heli the biological father. It is quite likely that the relationship of Joseph to Heli and Jacob was misunderstood by Julius Africanus or an error of textual tradition. Luke on the other hand not being Jewish did not concern himself with details and limited himself to tracing the genealogy of Jesus from Nathan. Besides this Luke was writing for a non-Jewish audience and was more concerned with showing Jesus as descended from God. He had to do this, since being a descendant of King David was not of any great significance to non-Jews. Therefore he traced the genealogy of Jesus through Mary who was the daughter of Heli. Had he traced the genealogy of Jesus through Joseph and Jacob, then Jesus would not qualify as the son of God. The genealogy of Luke was inspired by the baptism of Jesus when God cried out from heaven that “This is my beloved son”. By doing this not only did Luke show that Jesus was a descendant of David through Nathan, but that he was also the son of God (9). Even though it was Jewish custom to trace only male genealogies, Luke did not commit an error by tracing a female genealogy. There were two conditions under which it was proper to trace female genealogies. One “If a man dies without leaving a son, you shall let his heritage pass on to his daughter” (10), and two “This is what the Lord commands with regard to the daughters of Salphahad: They may marry anyone they please, provided they marry into a clan of their ancestral tribe, so that no heritage of the Israelites will pass from one tribe to another, but all the Israelites will retain their own ancestral heritage” (11). Mary satisfied these two conditions: her father had no sons and she married within her tribe: the tribe of Judah (12). Are Joachim And Heli The Same Person? It is probable that over the centuries the name Eliakim was shortened to Eli or Heli, after all, what is Heli in Greek is Eli in Hebrew. For instance the high priest in Sam 1:3 is called Heli in the Challoner-Rheims, but is referred to as Eli in the New American Bible and in Mark 2:14. Joachim and Heli seem to be the same person (13). The other principal controversy relates to Joseph’s hometown. Joseph is supposed to have descended from a Bethlehem family in Judea. This is also the birthplace of King David. Although by profession Joseph was a carpenter he was said to be a wise and learned man who was also a priest of the temple of the lord. He was a good-natured man, hard-working and a strict adherent of Jewish religious principles and observances (14). Even though it is generally understood that Joseph was from Bethlehem a town in Judea, there is nothing known about how he then finds himself in Nazareth in Galilee. It is quite likely that the skimpy means of his family and the rebuilding of Sepphoris and the ample work that was available there may have prompted Joseph to shift to Nazareth which was in proximity to this bustling town. Joseph was a carpenter by trade a skill that was in demand in Sepphoris. Whatever the reason we learn from the scriptures that Joseph is settled in Nazareth a short time before the Annunciation. 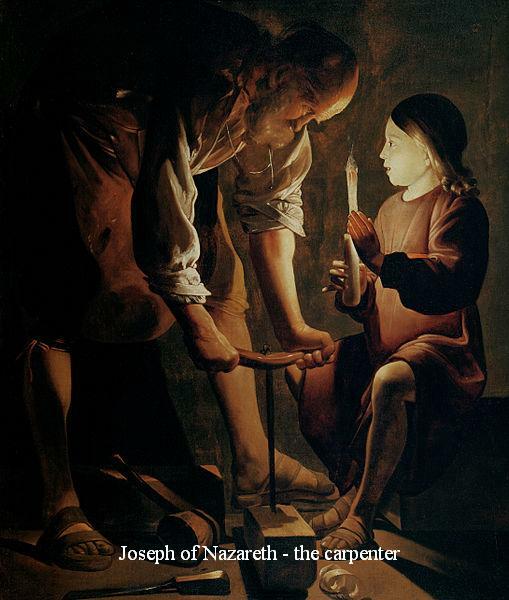 However from the lengthy stories relating to Joseph from apocryphal sources it would seem that Joseph was in Nazareth long before the Annunciation. According to apocryphal sources it appears that when he was forty years, Joseph married a woman named Melcha or Escha. Other sources name this woman Salome. In any case it is said that they were married for forty nine years and that the couple had six children – two girls and four boys. More about the hometown of Joseph of Nazareth later. Next PostIs The Introduction Of Nazareth Retrospective Prophecy?